Casually Elegant, Comfortable, Complete spacious, sunlit, airy year round 1br+ on its own 2.4 acre site with its own private 272' of waterfront. waterfront seating & firepit area w/hammock next to cottage. Owner managed with a careful eye to every detail, this very pretty traditional shingled building has soaring 15 foot ceilings and exposed beams. 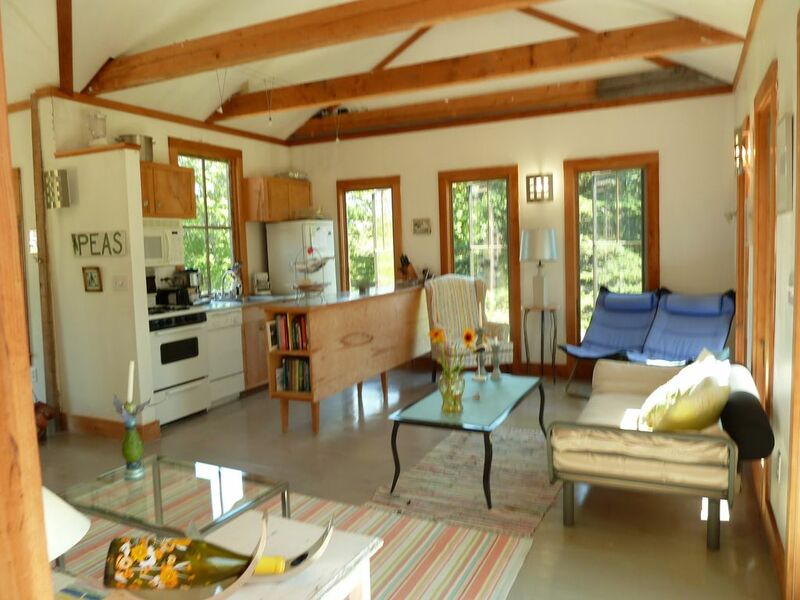 Two walls of windows with wrap around water views across open meadow to the cove and the estuary next to the cottage with its seating area and fire-pit. Well appointed with many amenities and conveniences not found in any other vacation rental. 1 bedroom-dbl bed dressed with good pillows, down alternative duvet finished with beautiful crisp bed linens; sleeping accommodation for 1 overnight guest in open living/dining/reading room. On site kayak launch affording experienced ocean kayakers an ideal daily departure for explorations of the beautiful islands in our archipelago outside the busy commercial traffic of our harbor and approaches to the Deer Isle Thoroughfare. A canoesand two small kayaks provided for experienced paddlers to explore our pristine mile and half long cove and enjoy up close views of its abundant wild life--eagles, herons, hawks, osprey and even an occasional seal or pair of otters. A haven for photographers, artists, naturalists,wilderness paddlers, writers, amateur astronomers and fishermen of all ages Wi fi is 24-7 exclusive to cottage. Quality, properly equipped offshore kayak rentals & paddle boards delivered by local vendor at very affordable rate. Early July to late October fish for striped bass by kayak or just enjoy exploring the cove for the pure pleasure of it. A perfect getaway retreat for a long spring, fall or winter weekend..a romantic setting for a proposal, honeymoon, special anniversary or birthday. 1 week minimum sat-sat July & August . 4nt minimum other dates. Wi fi is 24/7 via router from mian house and requires line of site w main house. weak and intermittant signal in cottage but excellent signal on premises immediately adjacent to cottage. ATT intermittant but cottage has a landline with unlimited US & Canada and a programmable answering machine. U.S. Cellular Excellent and Verizon very good. For a working vacation that requires 24/7 in cottage wi fi access see my other cottage proerty #13143375 Cove Meadow Cottage. Please note our rates are exclusive of Maine tax ( 9%) and cleaning fee ($10/nt). public policy continuing via my public interest research group providing technical support globally on issues of potentially non remediable envionemntal and community loss. It is one of the most beautiful waterfront properties I have ever seen. Never imagined owning anything of this scale and great beauty. Actually , it owns me. Heron Cottage was the perfect locale for our honeymoon. Even though we were there during off-season, there was plenty to explore (road biking, hiking trails, kayaking in front of the cottage, local fishmonger, etc). Did a day trip to Isle au Haut - major highlight. Magical place! Lindsay was very welcoming and helpful. We will definitely be back! The cabin and setting were nice, but the phone and wifi reception were not as represented and not as one should expect with accommodations of this type and price. I did not merely have some difficulty in obtaining Internet access: I was either unable to do do or, once I did, it quickly was lost. This was NOT Internet access, by any reasonable standard, and Internet access was clearly listed in this site's HomeAway posting. The sole reliable spot for phone calls was a small clearing approximately two hundred feet from the cabin; inside, calls either could not be made or received or their connection was quickly lost. When I brought this situation to the attention of the owner, she offered me the use of her nearby cabin, which apparently had better reception. But after I replied that I needed my own space for communications, she brusquely opined that the rental was not for those looking for decent communications access (despite the clear inclusion of "Internet" in its Homeaway posting) and that I should have inquired as to the quality of such access before my arrival. With the kind of rental at issue, and the amount charged for it (over $1300 for a week's stay), I don't think that my reasons for needing adequate phone and wifi reception should have been questioned, or that I should have had to walk a distance from the cabin or rely on another one altogether for Internet connectivity. Nor should I have been expected to inquire beforehand over the exact quality of that connectivity, any more than I should have been expected to inquire about the quality of other promised amenities. As I needed some wifi and phone access, at least better than what was available, I informed the owner of my intention to vacate the cabin and asked her for a partial refund that would be fair to us both, which she refused. Nevertheless, I vacated the premises as promised, and did not receive even a penny in adjustment for the week's rental. The owner did inform me that a recent change in carriers had resulted in periodic disruptions in the cabin's wifi service (something not noted in the rental posting), and she offered to have them come to the property and improve the receptivity But this was days after I had vacated, and it left me wondering why so simple a fix wasn't effected long before my rental. An unfortunate and avoidable ending to what should have been a relaxing and enjoyable stay. Brendan didn't take the time to actually read the full and accurate pre disclosure on wi-fi which at the time of his booking was available 24/7 only in line of site with the mian house and specifically not in the cottage. He made no effort whatsoever prior to booking to clarify /affirm his wrong assumptions..he simply booked.The terms of his lease were clear. Homeaway has found no merit to Brendons complaint.. It was his own error /oversight on an issue of occupancy of obviously paramount importance to him. accuracy of our presentation . This was very regrettable and upsetting to me as well but I had done all possible and reasonable to accurately describe each and every amenity in great detail.This "review" should not be allowed to be public .. There was no failure on my part . The property was exactly precisley as descrbed. It was just not what Brendon assumed. .
Lindsay's cottage lived up to every word in the description. We stayed for a week and did not want to leave. Though not right on the water, one can see the cove from the deck and it is a lovely walk through tall grasses and gardens. When you reach it, there are chairs and a picnic table. We spent many evenings just watching the fog and mist on the water. The house is sun-filled and well equipped, and the location is perfect for getting to the town or nature walks nearby. Barred Island Preserve is very close, and by far the best beach we encountered. Lindsay is incredibly thoughtful and cares well for her quests. My husband and I spent 4 nights at the lovely Heron Cottage. It is an inspiring light filled magical place. We were really able to relax and enjoy the changing tides, kayak, watching the fog roll in.. we built bon fires at night. Explored many beautiful coves and inlets, golf at the local course was a treat. Ate at the Cockatoo on Goose Cove Road and had amazing dinner and service. Went in a stranger and left feeling like a local. I was inspired to paint the beautiful cove during our stay as well. Lindsay was very helpful whilst also giving us much privacy. We would recommend this gem of a place to all. Thank you for this lovely review but mostly thank you for being such perfect guests. Folk like you who truly get our island and Cove Meadow make it all work and all worthwhile for all of us on the island. May winter be kind to you and bring yu many oter happy adventures together. To be perfectly honest, we like a vacation getaway that doesn't go overboard in catering to the crowds of tourists with organized outings. If you want to kayak in solitude watching eagles, lle in a hammock under a tree, pick your own blueberries in the meadow but then have a glass of wine or make an espresso in the cottage, buy lobsters at the dock or fresh chicken from a local farm or prefer to eat creatively prepared local food in an excellent restaurant in town, this place might be for you. Avoid the crowds, parking issues at Bar Harbor and enjoy a more genuine experience here where your enjoyment is what you make it, not contrived. Comfy but not to excess...you can live lightly on the land here, have a small campfire at night and watch the moon rise over the trees The cabin seems close to the road, but there's no traffic or traffic noise other than the distant hum of a lobster boat motoring by way out at the end of the cove. A special place ! Thank you so much for this gracious sharing of your experience here at Cove Meadow, our private wild island "park" and thank you so much for your kindly caring neighborly occupancy and care of the cottage, its grounds.and its window boxes and planters. Means so much.!!! Makes it all worthwhile!!! As veteran travelers, we have stayed in really cute places, but this one was off the charts welcoming and pleasant. The charm factor is important to me, therefore, we chose this place from the pictures, but until you walk in Heron Cottage, you can't really know the feeling you get. The windows were open with that wonderful Maine breeze wafting through the place, gentle classical music was playing, and gorgeous fresh bouquets of green and lavender hydrangeas and cut flowers from Lindsay's garden and goldenrod field were scattered throughout the cottage to welcome us. I just wanted to uncork a bottle of wine, sit down, and never move!! Her artistic touches are everywhere from the beautiful "expressions" she has painted down to the hand painted floors. The dining room preserved from the old cabin is a beauty to behold! Her flowering meadows have walking paths mowed, there are several fire pit areas to sit by your own fires and watch nature or enjoy the sun going down, the kayaks and canoe are at your disposal for leisurely trips out into the cove, and your very own vegetable and sunflower garden near the cabin abounds with lettuce, tomatoes, and cukes for making an organic salad to go with dinner. Oh my gosh! I cannot tell you how great this place is! Lindsay is delightful and thoughtful of her guests.Too bad I can't run up from Florida about once a month to get my Lindsay's cottage fix. Life is good there on the cove, I promise. Go now while you can!!! Pat, You and your husband also made the experience by so carefully researching and knowing exactly what you both sought and then being so positive and gracious when you found all was as pictured and advertised. Anyone who has the two of you as guests us very lucky indeed. You are both delightful. You should write a book or column on the all the amazing places your careful research has found. I am very happy you chose Heron Cottage and hope to see you again. minutes away; many wildlife and scenic tours by boat available.